Gamesetandmatch: Architecture is turning wild! On December 13 the conference Game, Set and Match was organised at the Faculty of Architecture in Delft by Kas Oosterhuis and his staff and students. The range of speakers reflected many different viewpoints, but what they had in common was an ‘interactive’ approach. Particular attention was devoted to such ego-shooter games as Unreal Tournament, Doom and Quake. Jeroen Mensink takes an in-depth look at the architect as Homo ludens in cyberspace. Chairman for the day Ole Bouman kicked off by listing 7 points for a new architecture. Archis's editor-in-chief called for a 'time-based architecture' of programmable (bearing) structures and surfaces, allowing buildings to accommodate different identities and functions. This requires a mix of physical and digital factors and moving buildings that adapt themselves to the needs of the moment. Architecture that has liberated itself from the limitations of the physical world can be transmitted via radio waves and the Internet. Time becomes Internet Time, and architecture an 'attachment', according to Bouman. As editor, Bouman also sees changes in the role of Archis. The magazine's new structure stems from a need for more interactive communication. Pages can be torn out, and comments added and sent to the authors of articles. Magazines are turning wild! Maia Engeli, from the ETH in Zurich, had examined the level-editors of such 'ego-shooters' as Quake and Unreal Tournament – initially rather shamefacedly in the evening hours, but very soon with students in the CAD Studio. They were given the task of building a 'level' in this game, which, unfortunately, was stripped of its weaponry: moving through virtual space without shooting very quickly turns boring. The benefit of 'level design', says Engeli, is that the designer learns to grasp the perception of the user. What's more, the designer builds at full scale rather than to a smaller scale, and the 'levels' can be changed fairly simply. In the ensuing discussion, Engeli offered a third advantage of these editors: you can 'walk' through them in real time and discuss them with other avitars (client, builder, etc.). In games like Counter Strike you can even communicate with sound, eliminating the need for a chatbox. It was, perhaps, the most concrete example now available to anyone with any knowledge of computers. Students from Kas Oosterhuis's Hyperbody atelier demonstrated the principle of movement and interaction in real, architectural space with a number of presentations in virtual spaces. Not all of them could be followed very clearly, however. The fact that the soundtrack accompanying the digital film of the woman in the company couldn't be heard was a blessing rather than a disappointment. And the interactive shop for the Lijnbaan – a 'commercial disaster' said the designer or was that a slip of the tongue? – showed an ability to see things in perspective. It was, unintentionally perhaps, one of the few critical notes heard all day. Kas Oosterhuis himself was assisted, virtually, with his presentation. Cindy, his charming, digital 'office assistant', interjected occasionally with questions and comments like 'Don't sorry yourself, Kaas. It's only a game'. Oosterhuis also emphasised the interactive aspect. He described his ideal architecture as one of 'spaceships' – interactive 'black boxes' that land autonomously on site through use and interaction. Now that society as a whole seems geared to experiencing events, architecture, too, must be an experience. To bring home the point, he showed a number of his projects, one of which was Transports – currently only on the Net but which might soon be built for the Efteling amusement park. Hasn't Michael Sorkin, with his 'Variations on a Theme Park', already shown that cities are increasingly resembling theme parks? A logical step, thus, to introduce this new form of architecture into society through a theme park. The most striking aspect of the animated film about this 'hyperbody' was that, while the building could move in all directions, its occupants were rooted to the floor! An experiment comparable to Transports, and Oosterhuis's North Holland pavilion, is currently under construction in Switzerland. 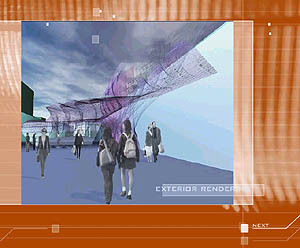 A group of researchers at the Institute for Neuro-Informatics in Zurich are building 'Ada: Intelligent Space' for the Swiss national expo Neuchatel Arteplage in 2002. The space will respond with light and sound to the input it receives from pavilion visitors. The presentation looked promising. It might even work. Open from April to September in Zurich. Oosterhuis also invited the composer who assisted him on the Neeltje Jans water pavilion. Or more accurately the spatial-sound designer, since Edwin van der Heide doesn't work with rhythm or melody, but with sound, and usually in a spatial environment. His installations and contributions to the work of others are based on the interactive relationship of visitors to spaces equipped with sensors. Sounds are determined by movement or other input from the human body. Yet it is still difficult to create a sonic landscape of any meaning in such an interactive situation. It usually amounts to a veritable Sonic Attack or a weak soundscape. It may only be a game, but if complete interaction in the physical environment does become a serious issue, then architects will increasingly need sound designers like Van der Heide to create integral spaces of experience.Only one true game designer was invited: Xavier Boissarie from France. Rather than showing any 'ego-shooter games', he talked about games that are not intended for the mass market – computer games without any clear finish or decisive final battle. They are more about generating sounds and musical fragments in a playful manner. In one, the 'gamer' controls a swarm of fireflies that bring to life a magical world. Michael A. Fox, head of the Kinetic Design Group at MIT and an expert in the field of moving structures, grabbed the attention by discussing commissions now being worked on at his office, which was set up just five months ago. A garage for a Porsche collector in the heart of Manhattan (a 'parking choreography'), an adaptable penthouse the layout of which can be changed via the Internet before the occupant heads for home, interactive robot flowers for a children's school, and adaptable aircraft interiors for Boeing. The most practical contribution came from Nils Addink of the Faculty of Architecture at Delft. Addink is developing a program to visualise the distribution of forces in structures. An inadequate structure does not result in a negative number; the structure just collapses on screen – useful and comprehensible for students and architects alike. Also noteworthy is that the program grows with the user. It becomes more advanced as the user acquires more experience with the program – a form of individual learning yet to be usefully integrated in interactive programs. The most theoretical, yet also most practically oriented presentation, both feet firmly on the ground, came from Ted Krueger (University of Arkansas, USA). He demonstrated that interactive communication could be relatively low-tech. His students' designs, with a high McGuyver content, showed that plugging people into their surroundings is just around the corner. Designs for NASA, also by Krueger's students, help astronauts to take the requisite physical exercise. Space travellers can thus keep their muscles in shape in their gravity-free environment. While working on this project, Krueger came to understand just how rapidly the human sensory system adapts to new conditions. With this knowledge, Krueger argues carefully and clearly for a rethink of the relationship between man and surroundings and for a less sharply drawn division between man and computer than has been customary till now. The word 'blob' wasn't uttered the whole day. Nor was a word spoken about the formal language of digitally generated architecture from architects like Greg Lynn. The key words of the day were 'interactivity' and 'game', the theme was the extent to which users (previously called occupants, users, visitors) are plugged into an increasingly technological, environment. Game set and match, and architecture is the game. The current projects of those participating show that, for the time being, it's still just Spielerei. Though Transports may possibly be realised at the Efteling grounds, the other projects are being developed within the context of exhibition pavilions and games for powerfully rich clients. It was unfortunate that former Archigram member Peter Cook could not attend. Cook and his cohorts were the subject of undiluted criticism from Tafuri for proposing an architecture and urbanism of movement. The Italian critic dismissed it as 'ironic nostalgia for the future'. Cook's views would have made for an interesting discussion about the presentations in the closing plenary debate.